Mixed Relay Cup - Timeline Television Ltd. The Accenture Mixed Relay Cup, Nottingham 2017 was an exciting new triathlon format featuring an international line up of seventeen teams from across the world including representatives from Japan, Australia, Germany and the UK. Timeline provided outside broadcast and RF services for the world feed as produced by Sunset + Vine. Timeline’s IP 4K HDR outside broadcast truck, UHD2, was onsite producing live host broadcast coverage. This triple expanding OB facility provides ample space and is an ideal production environment for such a major event. All RF facilities were monitored and controlled from Timeline’s RF trucks. 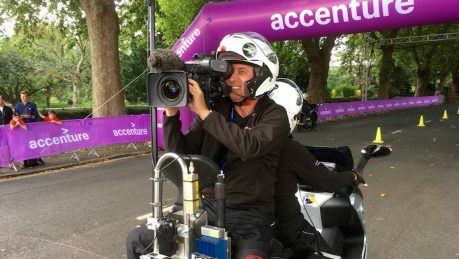 The varying disciplines of a triathlon demand a multi-format approach and this was serviced via drone, wireless cameras on both land and water, and motorcycle-mounted cameras. As well as capturing the action, Timeline also supplied the satellite uplink to allow the live broadcast of the World feed. The best in British and international triathletes went head to head in the Accenture Mixed Relay Cup on Saturday 2nd September 2017. 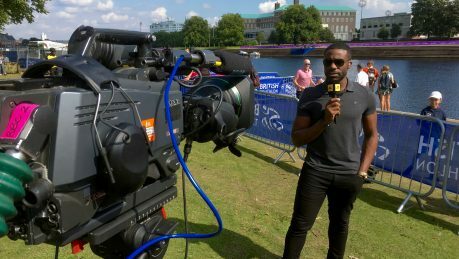 Find out more about our outside broadcast and RF services.